Ramachandran K.V. (1946) – “Gopala Nayaka” – The Journal of the Music Academy XVII, pp. 66-73, Madras, India. Ramachandran K.V. (1950) – “Carnatic Ragas and the Textual Tradition” – The Journal of the Music Academy XXI, pp. 99-106, Madras, India. Ramachandran K.V. (1950) – “Apurva ragas of Tyagaraja’s Songs” – The Journal of the Music Academy XXI, pp. 107-109, Madras, India. Ramachandran K.V. (1954) – “Grace Notes of Dance” – The Journal of the Music Academy XXV, pp. 93-100, Madras, India. Ramachandran K.V. (1992) – “Nuances of Bharatanatyam” – The Journal of the Music Academy LXIII, pp. 118-138, Madras, India. Each one of his lecture demonstration or article is a monograph in its true and literal meaning. From a musical angle for this blog post, I would like to take up one of his great contributions, which was the discovery of Sangraha Cudamani manuscript. As would be obvious from his latter day writings/lec-dems, he became one its staunchest critic and also an opponent of the system that it had ushered in namely the formal linearization of raga scales and the scheme of the 72 Krama Sampurna Mela ragas. KVR was a voracious researcher of Sanskrit texts and manuscripts and he was a regular at the Adayar Library . It was his meticulous research in this library’s manuscript collection which yielded him the Sangraha Cudamani manuscripts in the year 1927. Dr V Raghavan another illustrious contemporary of KVR acknowledges it in his Music Academy article in 1933². After having discovered it KVR turned it over to DR V Raghavan and to Pandit Subrahmanya Shastri. The original manuscript written in Telugu script bore the name “Sangita Sastra Samkshepa” and in the opening verses/colophon, it was made out that the work was part of the Skandapurana, that God Shanmukha wrote it and that it is called Sangraha Cudamani. Subsequent to its discovery, Pandit Subrahmanya Shastri set out to make extensive corrections to the grammar of the entire work and had it published by the Adayar Library in the year 1938. Today,thanks to the archiving project undertaken by the Govt. of India one can read the Sanskrit edition of the Sangraha Cudamani here . The discovery of the Sangraha Cudamani was preceded by the discovery of another related manuscript namely the “Meladhikara Lakshana” from the Tanjore Sarasvathi Mahal Library, a review of which was done by Sangita Kalanidhi T. L.Venkatrama Iyer⁴ . It would be interesting to note that it was during the same period, T L Venkatrama Iyer was also instrumental in getting the entire/available Caturdandi Prakshika (CDP) & having it published by the Music Academy. Parts of the CDP were already available, thanks to Pandit Bhatkande who had made a copy from Subbarama Dikshitar when he met in Ettayapuram during his tour of Southern India to document the history of Indian Music. Both the Meladhikara Lakshana and the Caturdandi Prakshika has been commented upon by Bhatkande in his seminal work ‘Hindustani Sangeet Paddhati’ and offers a very instructive comparison of the works as against those of others. KVR strongly believed that the 72 melakarta scheme as formulated with lists of janya ragas in the Sangraha Cudamani was not in accordance with our musical tradition, the tradition of Tyagaraja, Muthusvami Dikshitar and Syama Shastri. He made it known in his monographs that the work was most probably the handiwork of Taccur Singarachar himself. The Music Academy lecture of his in the year 1937 titled “The Melakarta – A Critique”³ is an eminently readable/re-readable authority on why Sangraha Cudamani should not be relied upon as codifying the grammar of our music. In his seminal paper, KVR advances the argument that 40 years after the death of Tyagaraja, Taccur Singaracar, edited much of the composer’s songs and fixed up the ragas of compositions that he didn’t know himself, by drawing raga names from the Sangraha Cudamani. KVR proceeds to literally rip apart the credentials of the work. He argues that the original manuscript was much like a “nadi grantha” full of errors, without any reference to who composed it and when. It was Pandit Subrahmanya Shastri of Tanjore who practically rewrote the entire text. Dr V Raghavan concurs as well in his work that the Sanskrit of the Sangraha Cudamani was “absurd”²! KVR in that lecture demonstration opines that in comparison to the textual tradition that has come forth and considering facts such as inclusion of newer ragas like Behag in the list, the Sangraha Cudamani is contemporaneous with Singarachar himself! KVR also avers that, Walajapet Ramasvami Bagavathar (Walajapet Venkatramana Bhagavathar’s grandson) confided to him that ragas that KVR had disputed were in fact arbitrarily assigned to Tyagaraja’s compositions, without any enquiry whatsoever from dubious sources. I would request readers of this blog to read and re-read this monograph of KVR which has been republished again by the Music Academy in its Platinum Jubilee Commemoration Volume. But KVR’s was unfortunately one of the lone voices of his times. The Sangraha Cudamani had marched on to become the de-facto reference standard and the holy grail of modern Carnatic musicology. And KVR would have definitely rued the day he had discovered it in the Adayar Library archives. It can be reasonably surmised that KVR brought out his discovery into the public domain as he found an eerie similarity between the ragas erroneously assigned to Tyagaraja’s compositions and those found verbatim in the Sangraha Cudamani. He would never even have dreamt that the proof that he produced would go on to undo whatever he had fought for and stood for ! In so far as his view that quite some Tyagaraja’s kritis were short changed of their ragas, KVR wasn’t in the minority. K V Srinivasa Iyengar another aficionado of those days and the brother of Tiger Varadacariar, himself in his publications (on a very different basis) bemoaned the fact that the music of Tyagaraja’s compositions had already been mutilated, beyond redemption. Mudicondan Venkatrama Iyer addresses some of these changes in his articles in the Journal of the Music Academy as well.Today, Sangita Kalanidhi Vedavalli , a chip of the old block , has been treading the lonely path to defend the Taraginis, Abheris, Ardradesis et al on one hand and “Nagumomu”, “Nadatanumanisham” et al on the other, from the onslaught of “change”. The havoc that was wrought, which KVR ascribes to the mischief of Sangraha Cudamani and to Taccur Singarachar, had 2 major fallouts. Incorrect ragas were arbitrarily assigned to many a composition. Today quite a few compositions of Tyagaraja are sung in ragas in which the composer did not originally compose in, as we know! Raga lakshanas of ragas which had existed for centuries which the trinity invested their krithis with, had been arbitrarily changed. Today on this count we have known instances of ragas which have been mutilated and the kritis of the trinity are taught and sung in the truncated version. Its indeed a very sad fact that Tyagaraja’s compositions bore the brunt of this rampage as the saint-composer in supreme confidence, thought it fit to keep the raga of the composition a closely guarded secret, which proved to be the proverbial Achilles heel. Be that as it may, it’s important to understand the true import of KVR’s (and of his ilk including Sangeeta Kalanidhi Vedavalli as well) anger and anguish and differentiate it from true musical innovation and orderly change. Raga Lakshana of Sindukannada a.k.a Kesari (as found in the kriti “Nannukanna talli”) – As per raga lakshana, the raga is supposed to be rendered with D1 whereas it is rendered with D2. Per KVR the raga should be rendered with D1 only. Raga of the composition “Sogasujuda Tarama”: The raga lakshana of Kannadagaula, a hoary raga (dealt with by Sahaji and Tulaja in their musical works) is embodied in the Tyagaraja composition “Orajupujuchedi nyayama”. In his lec-dem, KVR avers/alleges that the Gandhara and Nishada svaras occurring in the dhatu of Sogasujuda Tarama were ‘changed’ (‘filed off’- is the word he uses) to make its raga lakshana aligned to that of “Orajupu”. Today “Sogasu juda” has been passed off as having been composed in Kannadagaula. One wonders what the original raga of ‘Sogasu Juda Tarama’ was! Raga of the composition “Kalaharana”: This composition of Tyagaraja is rendered presently with S R2 M1 P D2 S/S D2 P M1 R2 S as a janya raga of Harikhamboji/Kedaragaula Mela. KVR forcefully and with the evidence of authentic oral tradition asserts that the raga of this composition was Suddha Saveri derived from the 1st ragangam/melakartha Kanakambari/Kanakangi with the suddha svaras S R1 M1 P D1 S/S D1 P M1 R1 S, which is known by its present name “Karnataka Suddha Saveri”. It’s worth noting here that Subbarama Dikshitar in his SSP clearly outlines the very same point. It’s a clear case where the name of the raga has been flipped and the kriti (Purandara Dasa’s gitam ‘Analekara’ as well as Tyagaraja’s ‘Kalaharana’ in the instant case) been shortchanged with a new melodic hue. KVR firmly believed and with conviction that Carnatic music shared many a common thread with other musical genres/forms including Hindustani Music. He also made no bones of his staunch opposition to the belief that Tyagaraja and Dikshitar belonged to different schools and they practiced/composed on the basis of Sangraha Cudamani and Catudandi Prakasika respectively. And each one of these is a subject/thread worthy of a separate analysis/blog post(s). Apart from musical history and textual tradition, on the musicological side KVR’s elucidation of musical concepts like mela, raganga etc and what they actually meant and aspects of musical delineation as found in our authentic texts such as Kaku, alapa & sthayavaghas are eminently readable and merits a follow-up blog post. With the passing way of much of the traditional & direct sishya parampara musicians and musicologists, the very fact that quite a number of ragas of kritis and lakshanas of ragas have been changed arbitrarily during the second half of the 19th century and into the 20th century perhaps, will one day be completely forgotten, buried in the sands of time. But I am sure KVR’s incisive and well researched tomes published this far will survive the ravages of time and serve as sign posts for researchers and students of music in the future, of these regrettable changes that had taken place in our world of music. I would like to conclude this blog post with a possibly apt musical homage to the great soul, combining the two – a padam in Sankarabharanam, ‘Manini Vinnave’ a rarely rendered composition in misra capu/triputa tala. This padam, which depicts a kalahantarika nayika repenting for her folly after having quarreled with her lover, is traditionally considered to be that of Karvetnagar Govindasamayya(1670-1730). Subbarama Dikshitar in his ‘Vaggeyakara Caritamu’, calls Govindasamayya a Margadarshi (“A Trailblazer”) for the genre of Tana varnas. Along with two other all-time greats, Patchimiriyam Adiyappaya and Sesha Iyengar, Govindasamayya shares the same sobriquet. The padam is traditionally sung starting with the anupallavi ” Maname Bushanamu” first. Padam lovers have always wondered at the fact that its dhatu/eduppu (Maname Bushanamu) is uncannily similar to eduppu of the Muthuswami Dikshitar magnum opus “Akshayalinga Vibho”. Could Dikshitar have gained inspiration for this eduppu from ‘Manini Vinave’? No one can be sure. But experts like Dr B M Sundaram have always opined that Dikshitar’s childhood was spent in the company of nattuvanars and dancers at Tiruvarur who used to interact very closely with his father Ramasvami Dikshitar. One can reasonably surmise that in that musically surcharged atmosphere, Dikshitar must have grown up hearing such great classics rendered by the artisans like Tiruvarur Kamalamuttamal. And so it doesn’t come as a surprise that some of the older padams and compositions like ‘Manini Vinave’ could have in probability inspired Dikshitar. I have chosen to present the composition in the Veena Dhanammal family version/patantharam, as taught by Kamakshi Ammal. In the clipping below, the composition is rendered by Vidushis Mythili Nageshvaran and Seetha Rajagopal. Accompanying them is Vid R K Sriramkumar on the violin and Vid Umayalpuram Mali on the Mridangam, recorded circa 1990. Vidvan Mythili Nageshvaran is KVR’s niece and Vidvan Seetha Rajagopal is KVR’s daughter. 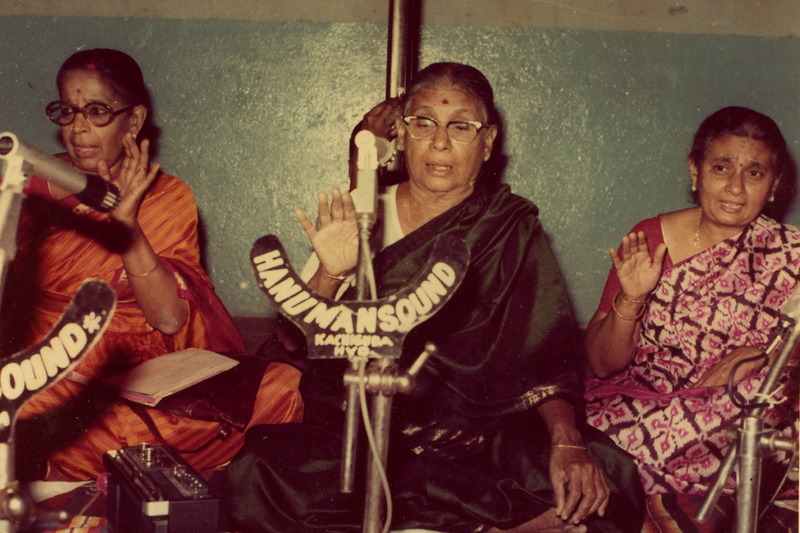 They had their musical training under Jayammal and Kamakshiammal respectively. For those of us who may not know, Vidvan Mythili Nageshvaran who is sadly no more with us, was a repository of many a rare varnas, kritis and padams learnt from authentic sources like Mysore Chennakesavayya , Savithri Rajan et al apart from Jayammal. 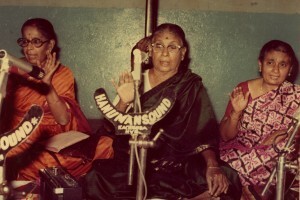 During the 80’s and 90’s both Mythili Nageshvaran and Seetha Rajagopal, learnt and also sang with Smt Mukta. I am greatly indebted to Mrs Seetha Rajagopal, daughter of the Late Sri K V Ramachandran for having provided me with first hand account of many of the details about him, photographs and other materials for this blog post. Dr V Raghavan (1933) – “Later Sangita Literature” – The Journal of the Music Academy IV, pp. 16-24 & 50-84, Madras, India. T L Venkatarama Iyer(1930) – “Meladhikara Lakshana – A Critical Review” – The Journal of the Music Academy I, pp. 41-46, Madras, India. Thanks are due to Sri Lakshman Ragde for providing me the lyrics of the padam “Manini Vinave”. Thank you very much for giving the text of ‘mAnamE bhuSanamu’ and supplying two caraNams I don’t know. I learnt this padam from my teacher, Smt. Savithri Rajan, and have the text from Sri T Sankaran in Tamil script; he noted that the mudra caranam was unknown. There are a few discrepancies between his text and that you have given, so I transcribed it below within parentheses, underneath what you have given (omiting the two additional caraNams). The forward slashes indicate line breaks. The anupallavi should be read as below without the note about the mudra carNam, which follows the caraNam. Would you please correct that? I had missed reading this post. Thanks for all the details, and the link to DLI book.